Last weekend at the FSU Relays we saw Emily Culley, Caitlin Wilkey, and Alyson Churchill go sub five minutes in the Invite 1600m and Olivia Miller go 5:09.27 earlier that day. 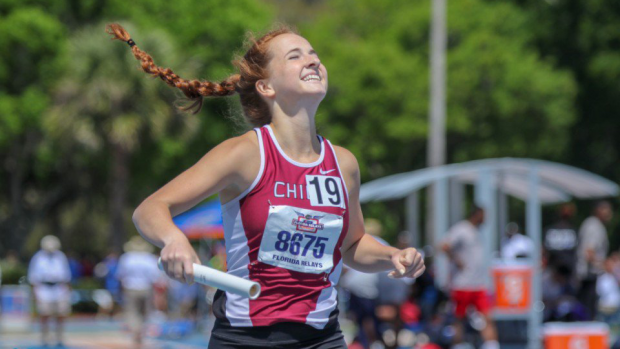 Going into the Florida Relays, we knew Chiles was going to be the team to watch after their performance last week, and let's just say the Timberwolves did not disappoint. On Friday, Chiles raced the DMR and dominated the field in a time of 12:06.99 with Lake Brantley taking second in 12:10.56. Olivia Miller took it out strong with a 3:40 1200m to start the ladies off in the lead. Miller handed off the baton to Wilkey who ran a brisk 61 second quarter to hand off to Churchill who went out in a 62 and came back the second lap of the 800m in a 75. Churchill handed it off to Culley with a staggering lead from the field and Culley kicked it in to run a 12:06 for the relay. After their big win on Friday, the Timberwolves came back to run a spectacular 4x800m on Saturday. Valerie Lastra's 2:14 kick off leg for Mater Academy put them in the lead and there was a significant gap between Mater, Northwestern, and Chiles. After the first exchange, Chiles took over second place from Northwestern with eyes on Mater Academy the whole way. Mater Academy maintained the lead, and until the last lap of the race it was their race to lose. With 200m to go Chiles takes off with eyes on a national leading time. The Timberwolves kicks it in to win in a national leading time of 9:14.93 after their national leading DMR time of 12:06 the day before. Next up for these ladies will be the Chiles Capital City Classic on April 6th and then the state series.